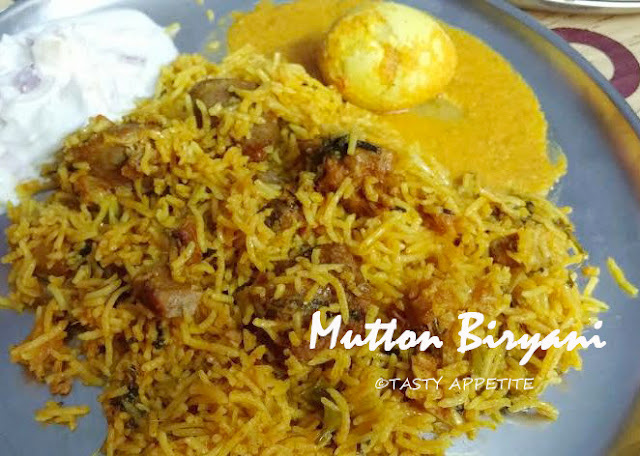 Andhra Mutton Biryani: I am very happy to share my most favorite traditional mutton biryani that can be made in a jiffy. 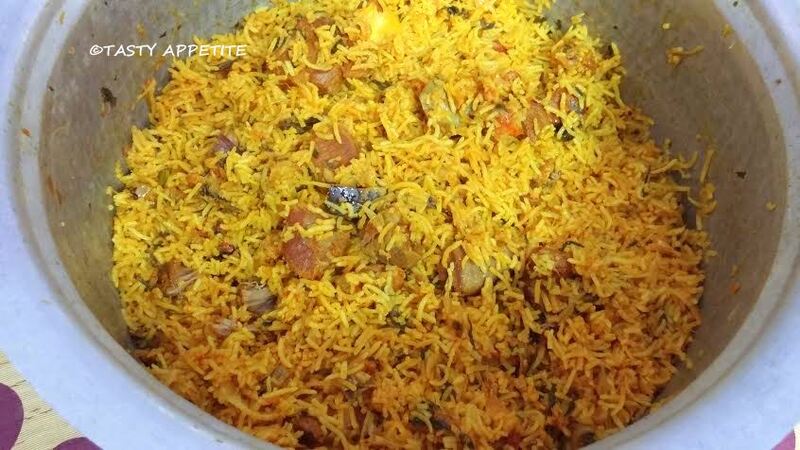 This is a delicious Indian recipe popular in Andhra Pradesh. It is different from traditional biryani recipe. It is simple and quick toprepare and suitable for new cooks, busy folks and bachelors. 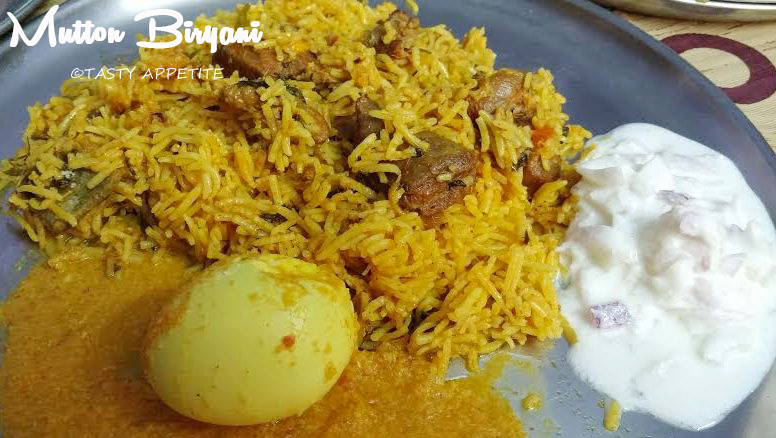 The secret to make any good mutton biryani is tender meat and cooking it the right way to juicy chunks. 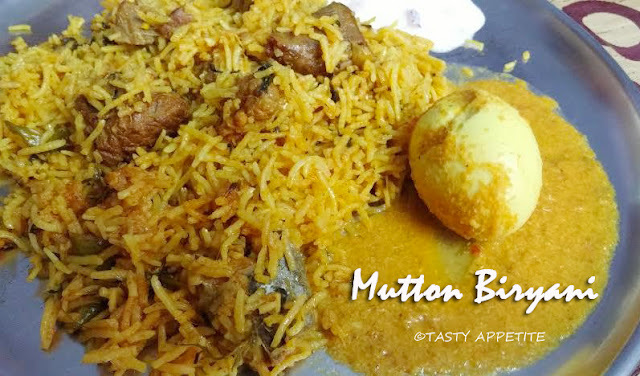 In this recipe I have included clear steps on how to cook mutton that yields soft and delicious taste. The recipe is made with mutton but can be substituted with chicken also. 1. Wash and soak basmati rice for 5 mins. 2. Drain it completely in a colander and set aside. 3. Clean, wash and chop the mutton to bite-sized pieces. 4. In a mixing bowl, add mutton pieces, yoghurt, turmeric pwd, red chilly pwd, ginger garlic paste, salt and garam masala pwd. 5. Mix well and let it marinate for 30 mins. 6. Transfer to contents to pressure cooker. Add 1 cup of water and pressure cook till the mutton pieces are cooked. 7. Meanwhile heat water in a heavy pan. 8. Add the basmati rice to the boiling water. 9. Cook until the rice is three-fourth cooked. 10. Drain the water and spread the rice in a bowl. 11. Take a wide thick bottomed pan. 12. Add oil/ ghee and heat it in medium flame. 13. Add spices one by one from bay leaf, cumin, cloves, cardamom, cinnamon and javithri. 17. Add sliced green chilly and ginger garlic paste. 18. Toss well till raw smell disappears. 19. Add sliced tomatoes and cook. 20. Add finely chopped mint and coriander leaves. 21. Add yoghurt and mix. 22. Add biryani masala, red chilly pwd and stir. 23. Add the cooked mutton along with water. 25. Cook till the masala attains thick consistency. 26. Add the basmati rice and mix gently. 27. Keep the flame in low and cover the vessel with lid. 28. Allow to cook for 5 mins. 29. Turn off the flame. 30. 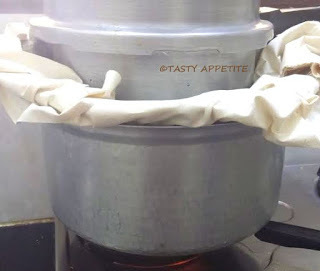 For Dum process, heat a dosa pan on low flame. 31. Place the biryani vessel over it and cover with lid. 32. On top of it place a heavy pan of hot water. 33. Allow the biryani to be in dum for 10 mins. 34. This way the biryani is not burnt at the bottom. 35. Squeeze few drops of lemon juice and fluff gently. 36. 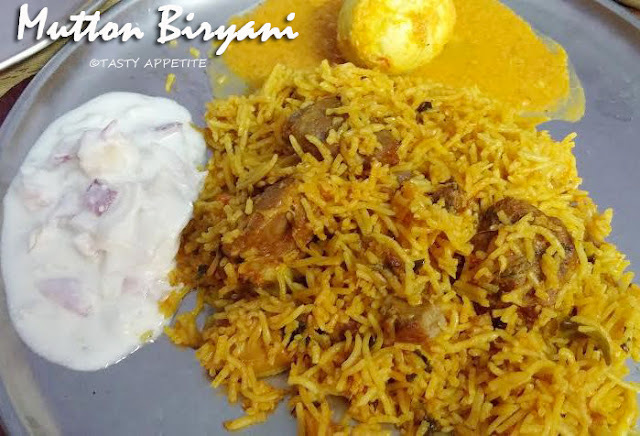 Lipsmacking delicious Andhra style Mutton Biryani is ready. 37. Enjoy hot with onion raitha and mutton/ chicken korma. Christmas Recipes / Merry Christmas 2015..!